Immaculate Conception sisters greet children at Our Lady of Armenia Education Center in Tashir, Armenia. More children there are growing up without fathers, and the Church is doing what it can to help. 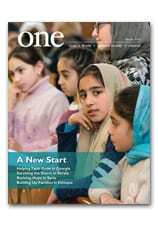 Read about Armenia’s Children, Left Behind in the Summer 2016 edition of ONE. Orthodox leaders attend a 25 June session of the Holy and Great Council of the Orthodox Church on the Greek island of Crete. During the week following the meeting, Orthodox clergy in the U.S. reflected on what the council would mean for Orthodox Christians in the United States. An Italian team has completed restoration of Crusader-era mosaics in the Church of the Nativity, but the mosaics will only be unveiled publicly after work on lighting, electricity and the fire alarm system is also finished. The work involved removing the layers of centuries-worth of soot and dirt — a result of the smoke of candles lit by pilgrims coming to venerate the site traditionally believed to be the birthplace of Jesus — from about 1.55 million tiny mosaic pieces that were reviewed and restored. Only 1,400 square feet of mosaics remain from the original 21,528 square feet that adorned the wall, he noted. The others were destroyed by rain leaking through the roof, he said. Made of stone, mother of pearl, and glass and gold leaf, the mosaics portray different scenes in the life of Jesus and the church, including the disbelief of Thomas, the Assumption and Jesus’ entrance into Jerusalem on a donkey. Piacenti said the mosaic of the disbelief of Thomas shows the date of 1155 and the names Ephraim and Basilius, presumably artisans who created the work. Some pieces of the mosaics remain missing and will not be replaced, he said, based on the theory of restoration that there should be a minimum of intervention on any piece. “Really, it is only conservation,” he said. One special moment came when restorers cleared away plaster from the wall bordering the roof in the main section of the church and discovered a seventh mosaic of a golden angel, in addition to the six they already knew existed. The angels’ arms gently direct pilgrims toward the grotto traditionally thought to be the site where Mary gave birth to Jesus. During the Ottoman Empire, the angels’ faces were disfigured with gunshots to the nose and so here the missing pieces have been replaced, said Piacenti. Both Islam and Judaism prohibit graven human images. The Church of the Nativity is shared by the Franciscans, and the Greek Orthodox and Armenian Orthodox churches. It is governed by the traditional Status Quo, the 1852 agreement that preserves the division of ownership and responsibilities of various Christian holy sites. In years past, the denominations have been known to jealously guard over their sections of the church, to the extent of fist fights breaking out over who could clean which part of the stone floor. Relations among the churches have become progressively more cordial over the past decade, and the three churches were able to come together under the auspices of a special committee formed by the Palestinian National Authority. Through joint discussions they reached a working agreement permitting the much needed restorations on the Church of the Nativity to begin. Once funds are raised, the next stage of the project will include restoration of the church’s 50 pillars and the study and restoration of the church floor and the mosaics underneath. The different denominations have come to similar agreements in the Church of the Holy Sepulchre in Jerusalem, allowing for restoration projects to begin there as well. Rebel fighters carry their weapons as they take part in military training 19 June in Daraa, Syria. The Syrian military has declared a three-day truce during the Islamic festival of Eid al-Fitr. The Rev. Mikael Khachkalian does some amazing work in a far-flung corner of Georgia — and he does it virtually on his own. He’s the only Catholic Armenian priest serving in the capital, Tbilisi — long one of the centers for Armenian Catholics in the country. Father Khachkalian ministers to his people by both preaching the faith and preserving a culture. From celebrating the liturgy every morning in Armenian to Saturday language lessons with the youth, he is a full-time advocate for Armenian identity in Georgia. After daily liturgies in the Armenian Catholic Center near downtown Tbilisi, the faithful explore the language of the liturgy as much as its meaning, sounding out unfamiliar Armenian words and practicing the proper pronunciation with the young priest and an assistant. For Father Khachkalian, learning the language is paramount to understanding the faith, preserving the community’s Armenian Catholic identity and encouraging its growth for the future. But these evangelical efforts are facing stiff headwinds in a country experiencing a revival in Georgian nationalism and Georgian Orthodox Christianity. ...Father Khachkalian believes that 90 percent of self-identified Latin Catholics in Tbilisi are Catholic Armenians. Despite their numbers, however, there is no official Armenian Catholic church in Tbilisi — or anywhere in Georgia outside of the small village parishes in Samtskhe-Javakheti. In a recent report, the priest outlined the need for a separate Armenian Catholic church in Tbilisi. “The Armenian Catholic community in Tbilisi is going through difficult times,” he writes. “It’s divided and weakened.” He highlights that the parish center needs “major repairs” and is not big enough for the entire community to meet at one time and celebrate their faith. “It is also a problem for us to build a church. We have not seriously tried yet, but I think we will have problems,” he adds. While Georgian law nominally does not prohibit Armenian Catholics — or any other faith — from building a church, in reality, it is very controversial. ...From morning until night, Father Khachkalian witnesses to the faith and culture that make Armenian Catholics a unique part of the universal Catholic faith. To spend time with Georgia’s Armenian Catholics is to rediscover the deep reservoirs of piety and purpose — and a remarkable strength of character — that have defined them for generations. It is also to realize, above all, that the story of Georgia’s Armenian Catholics is one of unwavering faith. Read more about the Armenian Catholic community in A Firm Faith. And discover the heroic work of Father Khachkalian in this profile. The war has greatly harmed Gaza’s vulnerable health system, which had not functioned well beforehand. Many services and specialized treatments are not available to Palestinians inside Gaza. There is a lack of medicine for cancer treatment, drugs for cardiovascular diseases, life-saving antibiotics and kidney dialysis products. ...A year and a half has elapsed since the war ended. And little of the money pledged from donor countries to rebuild Gaza has been received. The suffering in what many call the world’s largest open-air prison continues and it seems the rights of Gazans do not matter. According to several reports issued by the United Nations, Gaza will be “uninhabitable” by 2020. For us Christians, all this suffering, depression, melancholy and despair should not sadden us, but render us more mature to confront the horror of the occupation and serve the needy. When I look into the eyes of our children wandering in the rubble, or when I see their stare on television screens, expressing their angry feelings to reporters, I know that nonetheless there is hope. Palestine will never be forgotten; it will remain deeply anchored in the conscience of the world. ... I pray that justice will eventually be done. Read more of the Letter From Gaza. And check out the short video below, for another glimpse at life in the hospital. In the video above, released Tuesday, Pope Francis urges a political solution to the war in Syria. In the midst of evil, how does one offer love? Being with those in need is a start. From 8 to 12 April, the cardinal, who chairs Catholic Near East Welfare Association, led a pastoral visit to Iraqi Kurdistan to be with the families displaced from their homes in northern Iraq’s Nineveh Plain since August 2014. Read more and see additional pictures here. Below, photojournalist Paul Jeffrey, who covered the trip, describes some of what he saw and experienced. One frigid day in February, Kerry McLorg drove to an airport hotel here to pick up a family of Syrian refugees. She was cautious by nature, with a job poring over insurance data, but she had never even spoken to the people who were about to move into her basement. “I don’t know if they even know we exist,” she said. At the hotel, Abdullah Mohammad’s room phone rang, and an interpreter told him to go downstairs. His children’s only belongings were in pink plastic bags, and the family’s documents lay in a white paper bag printed with a Canadian flag. His sponsors had come, he was told. He had no idea what that meant. Across Canada, ordinary citizens, distressed by news reports of drowning children and the shunning of desperate migrants, are intervening in one of the world’s most pressing problems. Their country allows them a rare power and responsibility: They can band together in small groups and personally resettle — essentially adopt — a refugee family. In Toronto alone, hockey moms, dog-walking friends, book club members, poker buddies and lawyers have formed circles to take in Syrian families. The Canadian government says sponsors officially number in the thousands, but the groups have many more extended members. ...Much of the world is reacting to the refugee crisis — 21 million displaced from their countries, nearly five million of them Syrian — with hesitation or hostility. Greece shipped desperate migrants back to Turkey; Denmark confiscated their valuables; and even Germany, which has accepted more than half a million refugees, is struggling with growing resistance to them. Broader anxiety about immigration and borders helped motivate Britons to take the extraordinary step last week of voting to leave the European Union. In the United States, even before the Orlando massacre spawned new dread about “lone wolf” terrorism, a majority of American governors said they wanted to block Syrian refugees because some could be dangerous. Donald J. Trump, the presumptive Republican presidential nominee, has called for temporary bans on all Muslims from entering the country and recently warned that Syrian refugees would cause “big problems in the future.” The Obama administration promised to take in 10,000 Syrians by 30 September but has so far admitted about half that many. Just across the border, however, the Canadian government can barely keep up with the demand to welcome them. Read more. And to learn more about how the Canadian sponsorship program works, check out this sidebar.